Are about reflecting on the simple pleasure of planting pansies in the dirt. I bought two trays of pansies in a variety of colors and I had enough to not only fill my window boxes but also this little pot by our back door as well as a few out by our driveway. As the expression goes, you can bury a lot of troubles digging in the dirty and here’s one thing I know for sure: gardening is good for my soul. Pansies always make me happy — you can’t look at them and not smile! Personally, if I’m feeling troubled, it helps to yank out some weeds in the garden. There’s just something so hopeful about Spring flowers! 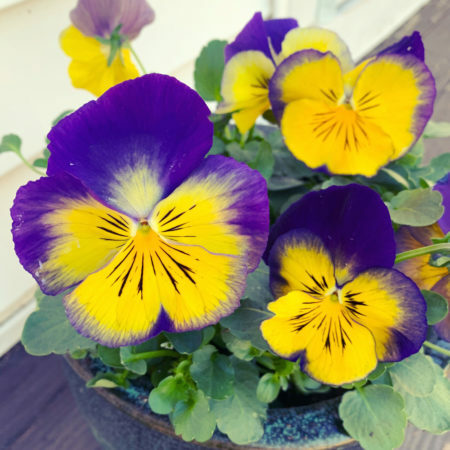 Pansies are always cheery with their bright spring colors and little faces. Pansies have the happiest faces! …they’re a “winter” bloom around here and now is when they start to look not-so-happy (at least the ones that have survived the deer 😉 and they get replaced with summer flowers. You know it’s truly spring when you plants pansies! Those are a beautiful variety. They are such Happy Flowers!! I didn’t know that saying but I certainly agree! I hope they brought joy and resolution your way! Gardening is most certainly good for the soul! Monday seems easier with those happy faces! Pansies are another flower that remind me of my mom. Their bright colors are just so happy and cheerful. Love your pansies. Always a cheery flower. Amen. Gardening and digging in the dirt is good for the soul. I potted pansies last week too. My pansies are still going strong, but I fear after this week’s anticipated 80 degrees they aren’t going to last much longer. They certainly seemed to love the drop in temps and the rain.